We use the highest quality composite materials for the treatment of caries. Filling cavities are designed to supplement damaged tooth tissue and protect against further development of caries. A well-protected tooth can be used for many years, provided that proper oral hygiene and regular dental checks are maintained. At the early stage of tooth decay, dental drilling can be avoided [see ICON treatment]. However, if you do not react in time, the tooth decay will go deeper into the tooth, the bacteria will attack the dentin (the main tooth tissue), making it soft and decalcified. As a result, a cavity will appear in the tooth. Then the dentist must remove the sick tissue, clean the hole, and then fill the tooth with the appropriate material [see the promotion for the treatment of cavity]. The condition for maintaining the teeth in a great shape is not only the daily oral hygiene with a toothbrush and toothpaste. Regular visits to the dentist every 6 months are also necessary. Thanks to them, you can detect teeth changes and fight tooth decay. The type and size of the filling depends on the destruction of the tooth by caries, as well as on the wall thickness of the tooth. The seal must be matched with the force that affects the tooth when chewing. An insufficiently strong seal can fall out or cause a tooth to break. Sealing of the tooth takes from 15 minutes to 1 hour. The dentist must be sure that the filling is sealed so that there is no gap around it, through which the bacteria could enter, causing secondary caries and carefully ground to be well-suited to the bite. During treatment at Luxdentic, we use the highest quality light-curing fillings from renowned manufacturers. Our offer of conservative dentistry is aimed at people of all ages. For children, we have colorful fillings that can be an attraction for a toddler and an incentive to visit a dental office [cf. adaptive visit for children]. They are used to fill cavities in milk teeth. Their advantage is the gradual release of fluoride, which protects the tooth against the recurrence of caries. The ICON method - what is it and when do we use it? ICON was created to stop the progress of initial caries and to eliminate white spots on enamel. White spots are noticeable in the initial stages of caries development, as well as after removal of the orthodontic appliance (decalcification). These discolorations make our teeth look a little aesthetically and lose their natural white color and glow. Then the ICON resin preparation comes in for help. ICON caries treatment consists in removing the enamel layer, and then applying to the affected tooth gel containing hydrochloric acid. The prepared tooth surface is dried and the dentist applies ICON resin on it. This liquid preparation fills carious lesions and then hardens. This prevents further penetration of the tooth through carious lesions and prolongs its lifespan. ICON is a painless and non-invasive treatment that regenerates enamel, does not require anesthesia or drilling. A graduate of the Medical University in Poznań. 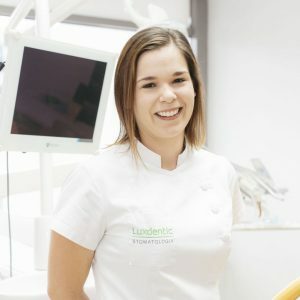 She regularly participates in courses and trainings, improving her skills, in particular in the field of endodontics, endo-prosthetics and endodontics in the microscope. She deals with the conservative treatment of adults and children and has a great approach to small Patients who like dr Justyna very much. She is also interested in prophylaxis, aesthetic dentistry, in particular reconstruction with the use of Enamel and ICON. She treats English-speaking patients. She graduated from the Medical University of Silesia in 2014. During her studies she was active in the Student Scientific Club at the Chair of Gum and Orthodontics Dysfunction. In 2013, she held internships at the Semmelweis University in Budapest. During the post-graduate traineeship she participated in voluntary work in Nepal, where she provided ad hoc dental help to local people and spread knowledge in the field of oral prophylaxis and hygiene in public schools. 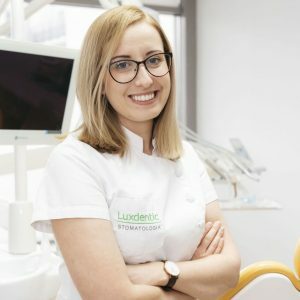 On a daily basis, she deals with conservative dentistry of children and adults, aesthetic dentistry, whitening, performs basic procedures in the field of dental surgery and prosthetics. She constantly improves her qualifications by participating in many trainings. Always smiling, empathetic, she takes care of a nice and stress-free atmosphere during the visit.